Training for both teams commence in April 2008. Our Ladies train from 6.00pm at Grand Prom Reserve in Bedford and our Men train from 7.00pm at Hawker Park in Warwick. Our Ladies have capped off another year with both the League and the MNA cup returning to our trophy cabinet. Greenwood were well represented in both the Men's and Ladies State Teams in Sydney, both amongst the players and management. A great effort from the Ladies team on their third title in a row at the Australasian Championships. Hi everyone, hope that you all had a good Christmas and that the New Year has been treating you well. Its time for us to start thinking towards the coming season... training will start soon so I hope everyone has done a better job than I have of retaining fitness in the off-season. But, on to the important news... Greenwood Gaelic Football Club will hold our AGM at The Mighty Quinn on Sunday February 4th at 2pm. (1) Come along and get involved. Feel free to nominate yourself or someone else affiliated with the club. (3) Come along and get involved. in Limerick Institute of Technology in Ireland. He has requested assistance with his final year project. I am in my final year and we have been asked to design a conceptual event idea as our final year project. The event that I have decided to run is an annual 3-day G.A.A tournament in Co. Tipperary, Ireland where teams from all over the world will be invited to attend. The focus in the G.A.A. is generally towards the men�s teams so therefore, as a former camogie player, I have decided that the tournament will be for women only. As you know there are many camogie and ladies gaelic football clubs all over the world, not just in Ireland. I propose that we bring these clubs together for the first time to have an international tournament held in the home of the G.A.A. The matches will be 10 a-side and any teams that cannot bring the full 10 will be permitted to attend as they can be teamed up with people from other teams, if they so wish. There will be a Gala dinner on the final day of the event held in a hotel in Tipperary where the winners will be given their prizes and where ladies G.A.A. itself will be celebrated. A huge part of this project is the Market Research section, which I am currently undertaking. We have been asked to send out as many questionnaires as possible in order to complete the market research. You will find attached to this message a copy of the questionnaires that I have written for this idea. reply rate from other teams has been very poor so far. I know this is a lot of hassle, especially since the event is only an idea and is not real, but I would be so grateful if you could do this as it is essential to my final year project. I have made the questionnaire as short and simple as possible to ease the process. It would be a great help if you could e-mail any completed questionnaires back to me as soon as possible or if you prefer, you could post them to me. Whichever suits you and your team the best. Once again I know this means a lot of work on your behalf, especially at this time of year, but I would be extremely grateful if you could just send me back as many completed questionnaires as you could as it would be the biggest help to me and my project cannot be completed otherwise. Well, the draw for the St Paddy's carnival has finally been released. To beat the heat the 7 a-side tournament schedule has been given an overhaul this year - split not only over a few different days, but also across some nights. Make sure you pay attention to the details in the fixtures. Note that these were updated for the guys games. Team entry fees must be paid in full before first game played. All games to be 7 a side with up to 8 interchange players in any given game. List of 15 players to be provided before game commences. Interchange system - to apply players can only come on and off via marked area. Only 7 players to be on the field at any given time. All players without exception to complete the GAA of WA Registration Form with two recent passport photos before the first game they participate in. All players to pay $10 Club fee before first game they play. All players to pay $20 GAA Registration fee before first game they play. The above two fees will be deductible from the club registration fees when it is due. All players from overseas to complete appropriate overseas Transfer Forms. All Team Officials, Match officials and players to adhere to our GAA Code of Conduct. All Teams to provide a Linesperson and two Goal Umpires for each game they participate in, each Match Official to wear uniform provided. Where teams are to provide a Match Referee, they are required to confirm who that will be to Damian McCague 48 hours before the game. Time - All games including Finals to be two fifteen minute halves, plus any injury time required. Drawn at full time in any Final - maximum two periods only of 5 minutes each way with a 2 minute break between halves. Then move to 21 metre line for "kick-off". i.e. five kicks each and then sudden death if necessary. Penalties - in the large parellogram to apply as per normal. Goal kick outs - (regardless of score/wide) to be taken inside the small parellogram. Goal Kick outs - to be taken as per normal in each of the three codes. Pitch Dimension - maximum length 80 - 100 metres and width 40 - 50 metres. Late start - Should a Team not be ready to commence 10 minutes after scheduled start time they will forfeit the game in question. The game will not be played. Panel - All teams to nominate a Panel (up to 20 players for duration of competition), list of players to be provided before first competition game. Penalty - can only play those nominated in first game. 50's - recorded by Match Referree in all games and used to determine the outcome of any game. Finalists positions determined (men's GF & Hurling) - by; 1 teams who win the most games, 2 in the event of a drawn number total scores for, 3 if still level total scores for divided against total scores and 4 least number of "50's" against. Finalists positions determined (Women's GF) - Due to the uneven number of games that teams play as above for Men's GF & Hurling except that for the team that plays 4 games you divide 4 into 3 for each result thereby determing a average over three games. All other playing rules of Women's/Men's Gaelic Football and Hurling apply. Note that the GAA rescheduled the guys games due to ground availability. Due to player availability we have rescheduled them again. We are aiming to get the other clubs to agree to rescheduling to 6pm Wednesday night for the remaining games. Thanks to our travelling pivotal club-men from last year we have some new photos in the gallery. Cillian (from Ireland) has sent though some shots from the Australasian games, and John Collins (from England) has sent through a shot of the Women's International Rules team. Visit our gallery to view these. Congratulations to the Greenwood Women who defeated the Finbarrs Women in the Final of the St Patrick's competition (3-27 to 2-5). Hope that you are having a good Easter. Training on the 11th April will be replaced by scratch matches against Morley. The games will be held at the Morley training ground (Bayswater Rugby Club - just being the Morley Recreation Centre). Ladies will be kicking off at 6:30 pm. The Men should be down around the same time to get kitted out and start warming up. This is a 15-a-side game so we need everyone down at the grounds... please contact Renae (0401 672 463), Brendan (0448 815 157) or Vaughan (0417 949 774) if you are unable to make it. In the spirit of making this a great social season we will be firing up the BBQ just after 8pm. Both clubs will be putting on the food and drinks... so if you can - plan to stay around and get to know some of your club-mates. The games from the frienddly match were evenly split - Greenwood won the Women's game, and Morley won the Men's game. Both were hard fought and a lot of fun, as was the craic around the barbecue afterwards. Thanks to Robbie O'Callaghan from Morley for suggesting the games, and to all members of both comittees who made it happen. The 2007 Father Kelly Cup Fixtures have been released. - Greenwood Ladies play at 11:20am and at 2pm. (Ladies will also need 3 volunteers to do goals & lines at 10am and 12:40pm). - Greenwood Men play at 10:40am and 1:20pm. (Men will also need 3 volunteers to do goals & lines at 12pm and 2:40pm). - Hurling is on at 4:40pm. Last Saturday (14th April) Vaughan and Bryce assisted getting the goals up at Collier Reserve. This Saturday (21st April) from 12-4pm we are looking for 2 more volunteers (maybe one from the Ladies team and one from the Mens) to help prepare the playing pitch at Collier Park for the matches on Sunday. Canteen helpers will also be needed for Sunday - Trina will confirm the details when she knows more. The 2007 season fixtures are now available as a PDF from - in a downloadable them from the GAA website. Join us at Collier Reserve in Como for our up-coming games. All players within the league need to be registered (even if only playing for one game). The registration form that covers both the GAA and Greenwood GFC is available at training from Vaughan. The GAA WA has reminded us that backpackers/travellers and players transferring from another Australian State or overseas will be required to complete a transfer form/registration form prior to ANY game (including pre season competitions). Irish backpackers/travellers need to know that the Perth competition is a "League", not a "Championship" competition. This should be noted on Intercounty Tranfer Forms upon return back to Ireland. The GAA WA has a registrar who is more than happy to help people through the registration process. Ask any of the GGFC Comittee members if you need help in this area. Congratulations once again to the Women in 2006 who, having won the League, went on to win their 6th MNA cup in succession. After finishing the 2005 league in 2nd place, the guys lost too many players due to travel and injury to maintain the pace in 2006. It is with regret that we announce that John Collins is returning to London to pursue his career as a sports journalist. John brought energy, experience and a fresh approach into the coaching of the Men's team and he has earned great respect and friendship in the process. All the best for the future John. Congratulations to everyone from Greenwood who has earned selection for the State Teams playing in the upcoming Australasian Games. Hope that you had a good break... but now its time to come back and start training for the 2006 season. Come on down - even if you haven't played before. Between the seasons not only did we have a break but so did the website. I'm pleased to announce that a new sponsorship has given the club a new online home. The Games Sub Committee of the GAAWA has announced the format for this year's St Patrick's Day games. The aim of this new two weekend draw is to create a family oriented atmosphere with a focus on fun entertainment. In addition to the games a number of club activities are planned so lets get down there and ensure that Greenwood is well represented. The following email has been received from the GAA WA. Please note the request for participants... contact one of our committee if you wish to help out. There are a few items to be bought to the attention of all Club members in this email. Can you please ensure ALL people within your Club are given access to this, and all other, information that is emailed to you? As one of only a few people within your Club who receive this information, it is very important that you allow all other members of your club to be aware it. If at any time you have any people to be added or removed from your Club�s contact list, please let me know. Future minutes for all Sub Committee meetings will be emailed to you as they occur. Three sub committees have commenced meetings (the Australasian Games, the GAAWA Games & Hurling) and two others are yet to field committee members (Youth & State Teams). It is extremely important that all Perth based Clubs have at least one representative on each committee. If someone within your club is interested in actively participating in any of the Sub Committees, please contact either myself or Damian McCague. We are especially interested in getting the Youth Sub Committee running ASAP. Due to the success of the recent workshop run by Brian Briscoe; we are looking to hold another workshop in the next few weeks focussing on the Ladies teams. To do this, Brian requires confirmation that all Clubs will have people attending. The first workshop had minimal Ladies team representatives, with the main focus on Men's team issues. We feel the Ladies teams would greatly benefit from a similar discussion. If you have interested persons - new members to your Club are always more than welcome too - please email me ASAP. Date & time will be confirmed soon. This year the GAA is introducing player identification cards. The club will be fined for playing unregistered players so ALL players must be registered. To speed up the process players are encouraged to bring a completed registration form as well as 2 passport sized photos. If a player is introduced during the season the GAAWA will require 5 days to process. Players named for games must be fit, available and at the game ready to play to qualify for that game. Rule 124: The Referee shall be given a list of players (team sheet) no later than half time. PENALTY: For players joining the game after half time - loss of game, club fined $25. Rule 21: A player must be registered to an affiliated club to be eligible to play. Players must have played a minimum of 3 games to qualify for any Final. Each registration card has a life span of 5 years. After this date new cards and Photo IDs are required. The Mighty Quinn have renewed their support for Greenwood for the next 2 seasons. As a result new uniforms are on order. The Quinn now has access to sport coverage direct from Europe and hence will be showing some GAA games. Last but definitiely not least recruitment... we love to see new players joining the club. Come on down and bring a friend. Its never too late to start finding out how much fun Gaelic football can be. The Government has approved funding for a dedicated facility for Gaelic Football in WA - Tom Bateman Reserve in Canningvale (corner Roe Highway and Nicholson Rd). The new facilities once completed will contain 5 change rooms, a canteen, a bar, function rooms and a quality ground for players and spectators. There is going to be a media event at the ground as a date to be announced. We have been asked to get a couple of people from each team at the ground for the event in team uniform� this could be good exposure for Gaelic and for Greenwood. Current players, past players and our supporters interested in attending on Thursday morning to throw on a jersey and have a kick in front of the cameras (or just to rub shoulders with the politicians) please let me know at training or just come on down. The venue for week 2 of the St Patricks Day Carnival is back at Collier Reserve in Como. The Greenwood Women will be back in action on the field in the finals at 3:30pm. The club will be in action in the sports events at 1:30pm. Bring yourself, your friends and your family down to cheer on the girls in the finals and enjoy the atmosphere of the day. A hot day and a number of injuries took their toll on the Men's team in the first week of the St Patricks Day carnival... As always the Women showed the way and will be back in the finals this weekend. The Greenwood Women will be back in action on the field in the finals 3:30pm. The club will also be in action in the sports events at 1:30pm. The club is currently without a President and a Men's coach. If you know of anyone interested and capable of filling either of these positions please contact any of the current committee. 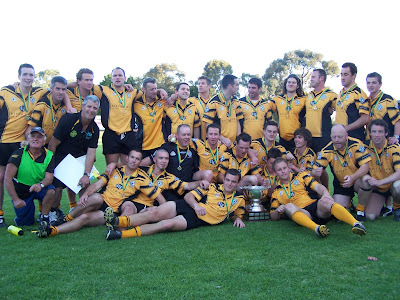 Registration for both the GGFC and GAA are due for the 2006 season. If you haven't got your membership forms in please do so soon. Get your Membership fees in to Lisa before the season starts, as fees will be rising after the first round of the regular season. The GAA WA has reminded us that players transferring from another Australian State or overseas (including backpackers) will be required to complete a transfer form/registration form prior to ANY game (including pre season competitions). Last but definitely not least - recruitment... we love to see new players joining the club. Come on down and bring a friend. Its never too late to start finding out how much fun Gaelic football can be. We have just received word that the State Media Launch of Gaelic football at Tom Bateman Reserve has had to be postponed. We will let you know when it is back on. The second day of the St Patrick's day carnival was a successful one for Greenwood. After joking that she would probably tear a hammy Jane blitzed the field to win the Ladies 100m race (although 100m appears to have shrunk in recent years). The Mens 100m was slightly longer than the Womens, but still shy of the true distance. Greenwood filled second and third - Congratulations to Vaughan and Steven for their efforts here. In the Ladies final the Women showed that they will continue be a force to reckon with this year. The final scoreline was 7-11 (32) to 0-2 (2). Well done ladies. The Father Kelly Cup will be played at Collier Reserver in Como on Sunday 9th April and Sunday 23rd April. Come on down to have a kick and show your support for our teams. The fixtures for the second week of the Father Kelly Cup have been modified. Two playing fields will be running simultaneously at Collier Reserver in Como (Collier - the regular field, and Collins - the pitch next door that is often used for warming up). The Entertainment� Book is a restaurant and activity guide that provides special 25% to 50% off and 2-for-1 offers from many of the best restaurants, hotels and attractions throughout Australia & New Zealand. The featured restaurants and other businesses do not pay to be included, they are selected based on awards, reviews and personal recommendations. Entertainment Books are available through the Greenwood Gaelic Football Club and part proceeds help support the club. For only $60 you can get possibly thousands of dollars worth of value. Bonus vouchers are available for the first 15 books paid for. Contact Liane via e-mail or at the games. The fixtures for the second week of the Father Kelly Cup have been modified. Two playing fields will be running simultaneously at Collier Reserve in Como which will keep things flowing without the day running too long. Our recruiting efforts have brought a few new faces into the team. It was great to be able to field a Men's team and have substitutes for the first game of the Father Kelly Cup. Game 2 showed that we can't get complacent - if it wasn't for some friendly faces who came down to watch we would not have gotten 15 people onto the field. At the recent special meeting Steven Mickel was appointed to the position of Vice President. Thanks to Steve for stepping up to fill this role in 2006. Orders are now being taken for the 2006 Gold Book Entertainment books. In addition to raising funds for the club these books can save you money - check them out. Getting back to a favourite topic - recruitment... we love to see new players joining the club. Come on down and bring a friend. Its never too late to start finding out how much fun Gaelic football can be. Here we are just before round 2 of the regular season. Games this weekend are at 11:00 for the Women and 12:15 for the Men. Fixtures for all upcoming games are available on the site. Our new uniforms are on the way. As of this afternoon they were at Heathrow airport. Until the new uniforms get here please stick as close to blue shorts and socks as possible. We have some byes coming up in May and June. or want to assist organise something let one of the committee know. Reminder that fees were due last week. Please catch up with Lisa if you haven't paid already. Fingernails MUST be cut or taped. No jewellery to be worn during games. No peaked caps to be worn during games. Minimum dress standards to be maintained during games (see Rules Book - rule #11 & #25). Remember that with the new GAA Registration process we need the forms sorted out midweek so that new players can play on the weekend. So that's another reason to get down to training on Wednesday nights. Its never too late to start finding out how much fun Gaelic football can be. Good news - Our new uniforms have arrived in Perth. After training on Wednesday night we will be heading over to our major sponsor, The Mighty Quinn, for the unveiling and presentation. Even if you can't get to training we hope to see you at the Quinn. Pearse Kerr has been a past player, coach and president within the Greenwod Club. As he celebrates his 50th birthday this week the entire club (past and present) wish to congratulate him on making it his far and thank him for his contribution. A reminder about the registration process that has been tightened up this year. Players must be registered with the GAA prior to playing - otherwise the club will be fined. Where appropriate transfer forms must also be completed as part of the registration process. Both the Registration forms and the transfer forms are available from Vaughan at training. A big welcome to John Collins who has just arrived in WA and accepted the role of Men's coach. John brings a wealth of experience having been actively involved in the game in Europe, the US and New Zealand. For Pearse's final game as coach before his world tour the Men took the game to St Finbarrs and came out winners 4-15 to 3-15. In the next game, with new coach John Collins at the helm, we took on Morley and achieved another win. The women are having another successful season. If anyone wants to volunteer to write up the occasional brief update for the website (and this newsletter) please contact Vaughan. The Australasian championships are here in Perth in October. Training has commenced for the Ladies Team (Friday evenings) and the Mens Team start this Monday. Everyone is invited to join in the try-outs, contact your coach for details. Both state teams recently took on Singapore and included a strong Greenwood contingent (including the uniforms which got a run with the Men's team). Even if you have no aspirations to be a coach all players are invited as this is a great introduction to the rules of the game. Australasian GAA Secretary will be in Perth on 15th July to run a Level 1 Referee's Course: 9am to 5pm at Collier Reserve Como. Cost is $10 per person and includes lunch. If you are interested in attending please contact the State GAA Secretary Chenoa Anderson (cmand@iinet.net.au). We're happy to announce that the first batch of Gold Book Entertainment books have all sold out. We have been able to obtain 5 more books... these will be available on a first come first served basis. An additional hurling game has been added on 13th August 2006 resulting in a change to the previously published fixtures. Teams of 4 at a table. Starting at 7pm. More details available from Eoin Carberry. Fogra - the newsletter of the GAA WA has had it's 2nd edition published. Grab it at the ground. Please note the requests for assistance with the State games and the Tom Bateman project. If you can help with either of these please get involved and contact the relevant people. Congratulations to Victoria's St. Kevin's GAC who are celebrating their 50th anniversary on Saturday, 28th October 2006. They have set up a website to publicise the anniversary and to take ticket orders... they'd love to have any ex members of St. Kevins attend. Congratulations to our Ladies team who have won the League for the 6th year running. Good luck to the team as they defend the MNA cup during the championships. The Men's championship game has been rescheduled to 12:30 on Sunday 27th August (half an hour later than the printed fixtures show). Here's wishing John and the boys success against the Western Shamrocks to take them into the next round. A brief heads up that we are organising the end of season presentations for the night of the Championship finals (17th Sep). If current form is anything to go by the club will have reason to celebrate that night so keep your calendar free. Congratulations to our Ladies team who have won the League for the 6th year running. Good luck to the team as they defend the MNA cup during the championships. In the first round of the championships the Men fought out a tight game and with the help of 3 goals were tied on the scoreboard with the Western Shamrocks. After 2 overtimes the scores were still tied. This game has been rescheduled for 15:30 on Sunday 3rd September, and all subsequent championship matches have been delayed by a week. The training for Men's, Ladies and the Minor's is in full swing. We have a number of players and coaching staff involved across all 3 teams. volunteer contact annahaynes@iinet.net.au and use the magic words - "I want to volunteer at the Perth Games!" Due to the events of last weekend a couple of quarter-finals games have been rescheduled for 3rd September. We will talk with the Mighty Quinn in the next day or 2 to change the date of the presentation dinner to Sunday 17th September. This will be after the finals so hopefully the club will have reason to celebrate. Tickets will be $25 and will include a 3 course meal. Please let Vaughan or Lisa know if you will be attending so we can finalise numbers. The GAA are having a movie night 21st Sep 2006 to raise funds for the National Championships. Contact Andrew "The Fuzz" Etchells for tickets or see the Fogra newsletter for more details . Congratulations to the 3 Greenwood Ladies who have been selected to represent Australia for the Women's International Rules Series to be held in Ireland in October/November. Renae Campbell, Pia Kilburn and Lydia Padgett made it through the rigours of pre-selection and we wish them well when they step out of Greenwood's blue and white into the Australian Green and Gold. For the 6th year running the Greenwood Ladies have won both the League and the MNA cup. Congratulations to Renae Campbell who won the the League Fairest and Best for 2006. Congratulations also to Eoin Carberry who won the Umpire of the Year award. A lot of fun was had by all who attended the presentation night... it is always a bonus when one of the teams is coming straight from a well deserved finals win. Images from the nigt have been put in the Club 2006 album. The first print edition of one of our newsletters was available on the tables on the night. If you missed out on the night and want to catch up on the news, or fill out the survey to help shape the future of the club you can do so here. It is with regret that we announce that John Collins is returning to London to pursue his career as a sports journalist. John brought energy, experience and a fresh approach into the coaching of the Men's team and he has earned great respect and friendship in the process. In addition to coaching Greenwood, John trained the Men's State Team and will be coaching the State Minor team throughout the Australasian Championships. His departure is a loss not only to Greenwood but to the entire GAA community in Perth. We wish you all the best John. Come along to celebrate the end of a fantastic week in Perth! What a big weekend for Gaelic Football in WA. Starting early in the morning the minors Gold team took out the Australasian Championships followed on by the Women's team and then the Men's... thats right, a clean sweep for WA. This has been written early Monday morning before sobriety has crept in, so please email Vaughan if I've missed anyone. The GAA has scheduled a Review Workshop for each Code (Seniors, Ladies, Minors & Masters Football plus Hurling); further details and dates below, in November. Each workshop runs from 7.30-9.30pm and we expect each Club to have the appropriate representatives present. The GAA WA Secretary wishes to know attendance by 5.00pm Friday 10th November 2006. Either contact Vaughan or Chenoa if you plan on attending. A power point review of each code will be sent out in advance. The GAA�s vision is that members will come with ideas and suggestions to improve the respective competitions and codes. In some cases we may need to conduct a second planning/strategy session early in January, before the AGM. Plans put into place must be a progression on prior year/s. However they also need to be specific, measurable and achievable. Congratulations to both the mens and the ladies teams who competed in Bunbury at the end of February. The competition was outstanding with all clubs fielding strong teams. The men put in a great effort in hot conditions and the women were once again victorious. Jane Padgett received player of the competition. Eoin and Sarah gave birth to their son, Jack Phillip Carberry on the 21st February 2005. The guys had a comfortable win against Southern Districts on Sunday 17th April, then bowed out of the competition the following week after an 8 point loss to Morley. The women narrowly missed the finals... requiring a 10 point win in their second game they fell 3 points short. Both teams had comfortable wins against Southern Districts. The guys won 3-16 (25) to 2-4 (10). The women were to coy to tell us their score. The committee is happy to announce that The Mighty Quinn will be joining us as our sponsor for 2005, and hopefully beyond. A big thanks to Bill and Bob, who we will get to know well over the year. A great social night out was had at the Mighty Quinn on 7th May 2005. Those who ate - ate well, those who drank did the same. Nathan and Victoria gave birth to their daughter Rosa Kate on Monday 9th April 2005. Both teams had a win against the Western Shamrocks; the girls won comfortably whilst the guys fought off a late surge by the opposition to retain victory. Dave won man of the match in the guys game. Both teams had comfortable wins against Morley. Nobody seems to recall the womens score apart from describing it as a "mauling". The guys led for the first 10 minutes of the game against St Finbars, but Finbars showed they wanted the ball and the win more. The final score Greenwood 1-9 (12) went down to Finbars 3-15 (24). Matt did a great job across the middle of the ground earning the fairest and best for the day. The girls won convincingly 5-13 (28) to 0-2 (2). Well, I didn't get to see all the Womens game but with the final score 5-22 (37) to 0-0 (0) there is little doubt that the Women are serious about aiming for a 5th year as champions. We just have to hope that the backline doesn't get too bored. The guys also managed a win against Southern Districts 3-17 (26) to 0-3 (3). Rory was winning the low ball all over the ground and well deserved the Fairest and Best award. 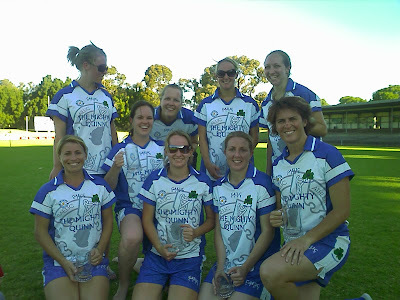 The Gaelic Athletic Association of Australasia is holding a fundraiser to help send the teams to the 2005 World Cup. Cost $20 per ticket. This includes four $5 drink vouchers. See Lydia, Jane, Renae or Pia for tickets or more details. One of Greenwoods major fund raising activity for the year is planned for Saturday 16th July. Come along to our quiz night at the Mighty Quinn Tavern from 17:45. Bring yourself, your friends and your family... be prepared to have a laugh, a drink, win some prizes and maybe answer some questions. Tickets are $8 if bought in advance or $10 at the door. Tables of 6 to 8. Anyone able to assist with sponsorship or prizes for the evening please contact Chris (chris.collins@ozemail.com.au) or Vaughan (vaughan@castinet.com.au). All sponsors will be noted on the night as well as on the club website. Well the first major fund-raiser for the year is now over. From all accounts those that attended had a great time and every table managed to snare a bargain in the Silent Auctions or pick up some prizes during the evening. The final tally was $1,116.60 raised for the club. Many thanks to all our sponsors who enabled us to exceed our expectations for the evening. Please show our sponsors support... keep their businesses strong so that they can help us again next year. Tickets must be purchased before 28th August. The End of Season Wind-up for Greenwood Gaelic Football Club has been planned for Saturday 15th October from 19:30 at the Mighty Quinn Tavern. $20 a head - includes dinner and limited drinks. Contact Pearse, Lydia (lydia@pc.wa.edu.au) or Vaughan (vaughan@castinet.com.au) to confirm your attendance by 30th September. For the 5th year running the Women have won both the league an ths MNA Cup. Congratulations!!! Thanks to Pearse we have been able to obtain a range of photos from the history of the club. These have been posted in a number of albums sorted by decade. Take a look in the archive gallery. Since the local 2005 season ended so much has occurred. Rory Kerr was runner up for the Men's League Fairest and Best and won the Young Player of the year award. The End of Year function was held at the Mighty Quinn on the 16th October. Photos from the night are available in the photo gallery. Special thanks to our coaches for their efforts during the year, and congratulations to the award winners that were announced on the night. Thanks to everyone for their participation and support in 2005. It was great to climb another notch on the league ladder this year... even if we faltered a bit at the end of the season it was a great improvement. In the St Patrick's Day Carnival the Men's team was undefeated, however missed the final on a countback of "45"s after drawing the semi-final against Morley. The Guys finished 2nd in the league and at times gave Finnbars cause for concern. Travel, work and injury took its toll towards the end of the season - not only did we lose the Monaghan boys, but we also lost some of the Aussies including our Captain (enjoy Melbourne Matt). Being only able to field a team of 12 the week before the finals prompted some soul searching... but former players and those with injuries stepped up (and back onto the field) to ensure that Greenwood had a chance in the semi-finals. Last year we were mostly first year players. Now with the experience under our belts we just need to add to our numbers and set our sights on one more notch up the ladder, into first for 2006. 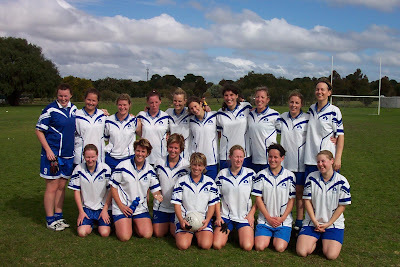 Greenwood Ladies have successfully participated in another year of Gaelic Football in Western Australia. Although we were knocked off early in the pre-season tournament by Shamrocks, the girls pulled together under the guidance of coach and player Renae Campbell to take out the St Patricks Tournament, the League and MNA Cup. The successs of our ladies team is largely due to our players returning year after year and their dedication to training. Four of our players represented Australia in the World Cup in September and were undefeated the entire tournament eventually winning the cup for the Third time in a row. Three of these players then flew 20 hrs from Ireland to join another seven of the Greenwood girls in Brisbane to represented the state team in the Australiasian Championships. The final was a nail biter with Western Australia stealing the lead from Brisbane in the final 10 mins of the Grandfinal. With the average age of the team sneaking up each year we are keen to get some new blood into the team and welcome any interested people to join us.